Streak-Gulf Island Operations, said the Gulf Island V is one of the larg- est and most versatile vessels of its type in the world. It includes air- conditioned quarters and galley fa- cilities for 42 persons, a large heli- port, a 75-ton-capacity crane, two 75-kw generators, 3,200 square feet of open deck space for up to 250,000 pounds of deck cargo and more. Lift boats move to and from off- shore installations under their own power. Once alongside a rig or plat- form, the boat lowers its elevated legs to the ocean floor and becomes a stable platform from which a vari- ety of work is performed. Some of the more than 20 functions are: sandblasting and painting; wireline work; pile and conductor driving; salvage work; work platform for fab- rication crews; quarters for work crews; diving support; and coring. Streak-Gulf Island Operations fleet are currently under work contracts. 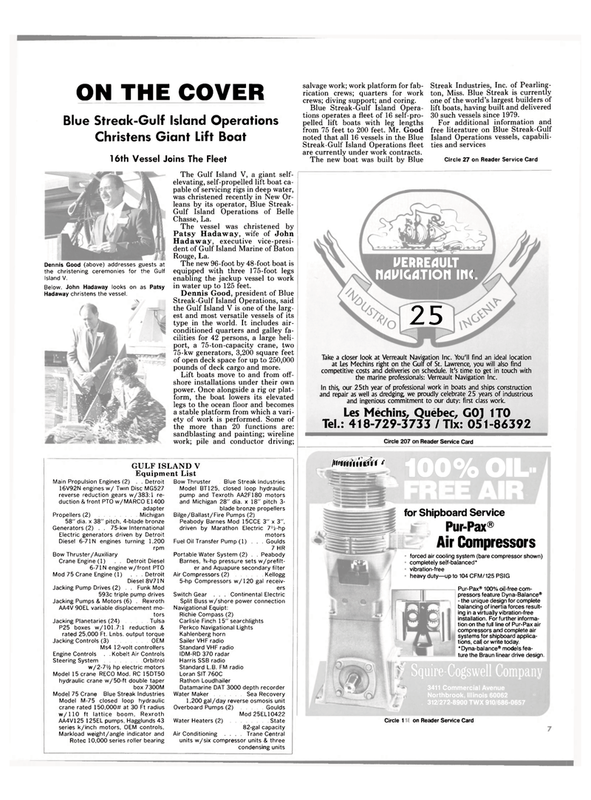 Streak Industries, Inc. of Pearling- ton, Miss. Blue Streak is currently one of the world's largest builders of lift boats, having built and delivered 30 such vessels since 1979. Take a closer look at Verreault Navigation Inc. You'll find an ideal location at Les Mechins right on the Gulf of St. Lawrence, you will also find competitive costs and deliveries on schedule. It's time to get in touch with the marine professionals: Verreault Navigation Inc. In this, our 25th year of professional work in boats and ships construction and repair as well as dredging, we proudly celebrate 25 years of industrious and ingenious commitment to our duty: first class work. Pur-Pax® 100% oil-free com- pressors feature Dyna-Balance® - the unique design for complete balancing of inertia forces result- ing in a virtually vibration-free installation. For further informa- tion on the full line of Pur-Pax air compressors and complete air systems for shipboard applica- tions, call or write today. *Dyna-balance® models fea- ture the Braun linear drive design.